Children are born inquisitive. Since the time they are born, they embark on a quest to make new discoveries and to explore the things around them. They are sensitive to what they hear, see, touch and feel and they use these abilities to question, understand and figure things out on their own. This helps them learn more about the world as they grow up, to engage in social activities more efficiently. Help them see what’s around them with some fun spy gadgets. This natural tendency to discover and explore qualify the young kids to be little spies who are forever observing new things and then returning to their elders to report what they see. This is their attempt to find out explanations of what they have discovered or merely to share their own experience with them. So, while this is already an inherent nature of the child, parents can actually make great use of it by giving their child a toy that matches their interests. With technological advancements and innovation, there are various toys and games that have been made that motivate the child to play different roles. They can be doctors, teachers, fashionistas, bakers, baby sitters, policemen, etc. With these wide variety of professions to choose from, children have more options to fulfill their imaginations in a much more realistic way. They can freely express themselves and be who they wish to be while playing. In addition, these fun-filled games can play a great part in helping your child develop cognitive and social skills by allowing them to be more attentive and observant to the roles they intend to play. This can help build an educational foundation while at the same time encouraging the child to play and participate in activities which are not too boring. By providing something of their own interest, you can teach them more effectively. Among these educational toy sets is the Spy Gear Ninja Mission Set. This toy allows your child to express their curiosity and to practice their spying skills more openly. While being an exciting and fun game, it simultaneously inspires the little spy to use their imagination and to learn about the various characteristics in detail. It also makes them more responsible as well as intelligent because they get to make discoveries on their own. What’s Included in this Spy Gear Kit? Wrist Blaster- With this you can fire darts quickly and easily towards enemies. You can activate them with your fingers to shoot them at one glance. Motion Alarm- This allows you to send a warning if anyone gets too close. You can use this if you want to keep a check on who is coming closer to you. This is to ensure safety and to keep you alert and informed. Night Spyer– This allows you to see in the dark or during night time up to 25 feet away. It also features a 2x magnifying lens and a red beam of light. As a spy, you may have to go for missions without being easily detected. That means, you have to step out in the dark. This night spyer provides a night vision to not only remain hidden but to keep an eye on whoever in near you in the dark. Spy Pen Blaster– With this, you can write covert messages and then launch them as darts to send important messages to someone. You can write codes and secret clues if they are in your team. Check our more options here: The Best Spy Pens. Instructional guide– This detailed instructional guide equips you with the knowledge to play this game as well as with codes that you can use while playing. Batteries– There are 2 LR43 batteries included to operate the Night Spyer. However, the Motion Alarm requires 2 AAA batteries which are not included in the set. For a kit that includes more things in it, check out this one: Alex Toys Undercover Spy Case Detective Set. 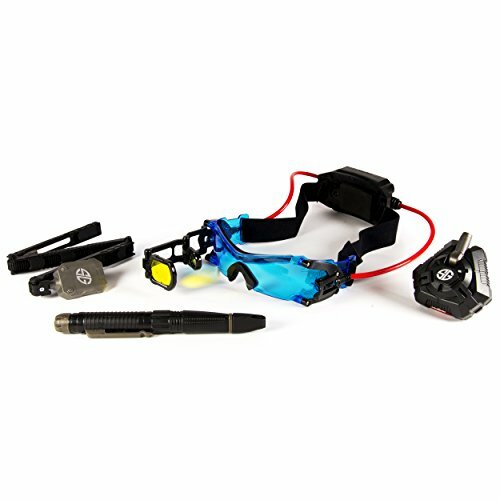 Overall, the Spy Gear Ninja Mission Kit includes all the devices that are essential to accompany your child on their secret missions. The unique and innovative gears allow your child to use their imagination to the fullest and to translate them into reality. Also, it helps them develop problem-solving skills and provides room for the child to develop his own thoughts and ideas. This game is great for outdoors as well as indoors as it creates an environment for the child to use explore their surroundings. This Spy Gear Ninja Mission Kit is easy to carry around and handier if you are planning to travel with your child. Being an educational game that promotes pretend play, the Spy Gear Ninja Mission Kit is perfect for your little one to gain more knowledge about spying and to grow into a more responsible adult by role playing. While there is a rise of video games and phones, it is important for us to bring back these games which focus more on keeping the child physically and mentally active. This is better than keeping them stuck to a screen where their mind and body both are not at work in a healthy way. As a parent, only you can take up this responsibility and focus on your child’s growth and development especially at the key stage of their life. Moreover, it is a great opportunity to combine learning with play and encourage them to be who they want to be. These games are not just good for mental development and social interaction but also help the child reflect on what they like. It assists them in exploring themselves so that they can make the choice for themselves and recognize their hidden skills, talents and abilities. Therefore, if you have a child who is extremely curious or who loves spy and ninja games, then you can further nurture their curiosity with this exceptional and innovative Spy Gear toy set. You can inspire them more with these valuable gears and encourage them to make discoveries and explorations on their own. You must remember that the more curious a child is, the more they learn. So, use your child’s desire to learn and help them pursue what interests them. Redirect them instead of discouraging and you will see the change as they will grow up. Is this one of the top picks for spy gadgets for kids? Or, do you have another recommendation? Leave a comment below and let us know what you think.